I received an email from a reader recently asking for my help to program an Arduino board as a safety cut out for a machine that he was building. Eric was building a cartridge reloading machine and needed a safety cut out to protect the motor and clutch when the motor jams. A magnetic Hall Effect sensor was bolted onto the machine and hooked up to an Arduino which then needed to be programmed to monitor the signal from the sensor and trigger a power relay when the sprocket stopped rotating. The software solution turned out to be remarkably simple as you will see later. 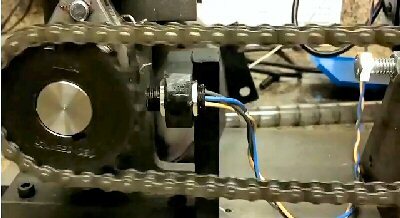 In the video above you can see the machine in motion with the Hall Effect sensor mounted on the left hand sprocket. The code for the Arduino sketch that provides the cut out is shown below. The code maintains a timer which is constructed by comparing the current elapsed time from the function millis() with a snapshot of time saved when the sprocket sensor changes state. Each time a state change is detected the timer is effectively reset and if the timer reaches 1000 mS (1 second) then the safety cut out relay is triggered. I hope that this example project has shown you how simple it can be to use microcontrollers in real world situations. Now sign up for the HDE newsletter to keep up to date with what's happening on the site and get some freebees too.